If you've been following my blog for a few years you might remember that The Man and I have flipped several houses. It is so satisfying to take something falling apart, and make it beautiful again. Over the weekend a good friend and I went out... We went to the big craft show that's local every year. We went thrifting. We went on adventures. We met some interesting characters. And we found this house. It's for sale. And it has so much potential to be beautiful again. It had so many great features, but it was just falling apart. 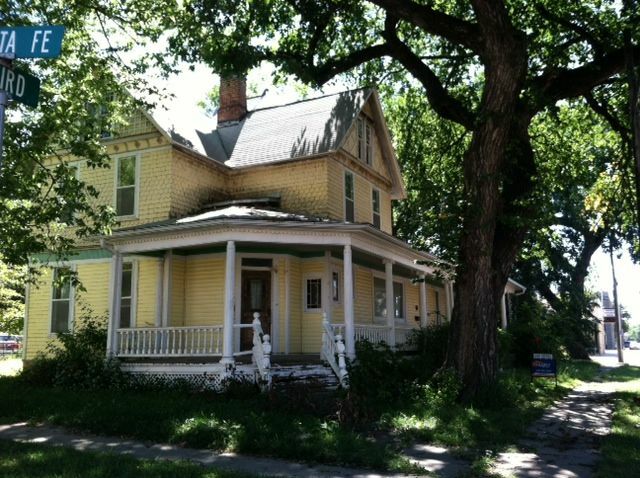 Someone with lots of time and lots of energy needs to go to Marion, Kansas and buy this baby! But right now we just can't do it. Every waking moment is spent working on The Rusted Chain BARN. 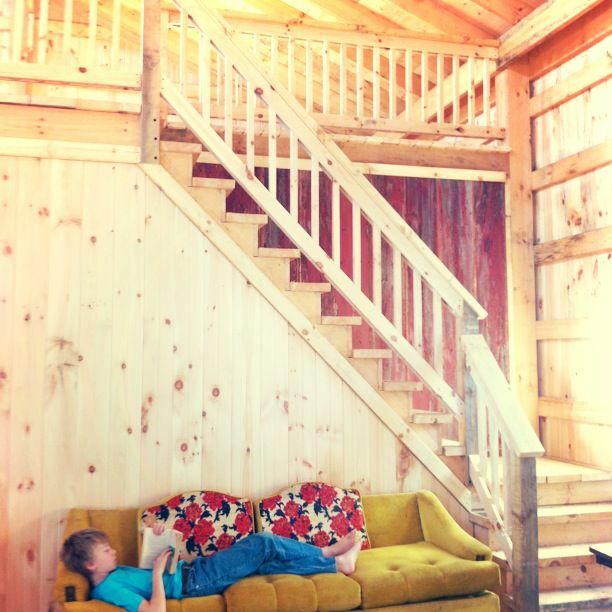 We're putting bits of reclaimed barn wood on the inside, like this spot on the stairs. Here's a fun little tidbit: Did you know that wood expands when it's wet? And it contracts when it's dry? You knew that. Well when the barn was being built, we were in the middle of constant floods. And the wood was.... WET! We did our best to keep it dry, but it still soaks up moisture just from the air. And the when the dry heat finally came and lasted for weeks, guess what happened? The wall contracted. And there were gaps where you could see daylight through. So that entire wall had to come off and be put back on, with dry wood, squeezed tight. The deck on the West side is also nearly done. And oh, it's so pretty! I can't wait to line it with rocking chairs and watch Kansas sunsets. It's getting there! 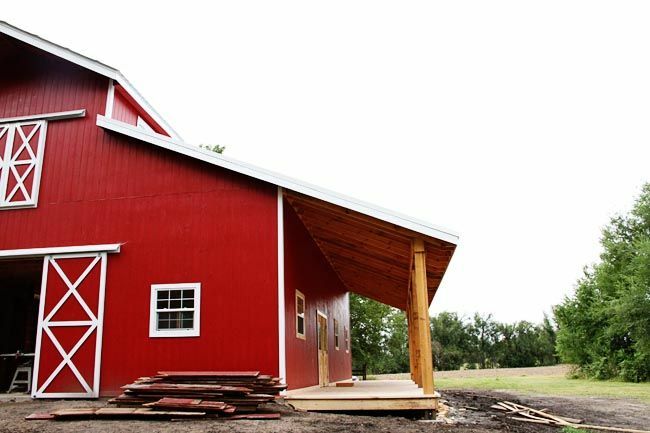 People keep asking me "When will the barn be done?" And I say, "It depends on your definition of 'done'." It is mostly done now. But there are still projects inside that will last through the winter. Just like flipping a house, building a new one, or any other remodeling project, it just takes time. But we are loving it so much! Have you tackled any BIG projects recently? 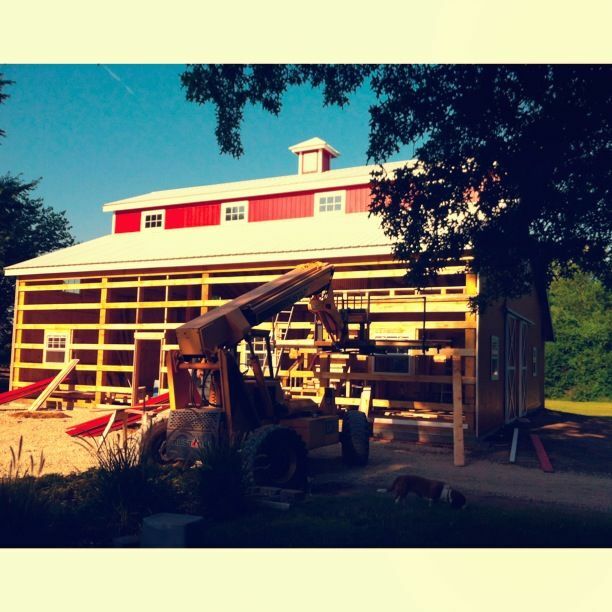 I can not wait to see this barn next weekend!!! !